Another Quark Question - SolarChat! I am sure there has been info posted about removing the built in telecentric from the standard Quark models, but I have not been able to track the details down. If you remove the built in telecentric I assume you can mount it with a different amplifier (Powermate for example) to better match your setup. Just curious what thread yo have remaining on the quark body to fit parts to it. If the telecentric is removed is any other crucial element for the Quark operation lost (blocking filter built into the telecentric or other issues)? the telecentric is composed by two doublets, the large converging one can be removed by separating the red and the black barrels of the Quark. It is placed in the black barrel and can be easily taken out by unscrewing its retaining ring (NB, opening the Quark will void the warranty). For removing the negative small doublet of the telecentric you'll need to remove the front BF first, behind it there is the doublet. This can be done from the 1.25" barrel side, there is no need to have the Quark opened. Once the small doublet is removed (it can be slightly difficult as its retaining ring is very thin and recessed) the BF shall be put back in place and secured by its ring. In this configuration the device needs an external amplifier to work. Unfortunately the BF is very small and any telecentric placed in front of the Quark would have its diverging group too far from the BF introducing a strong vignetting as only the central part of the ray bundle passes. For HR imaging of a small area of the Sun this is no problem, but visually it is quite an unpleasant view. The Barlow should be not too strong (i.e. of very short focal length) and shall be placed as far as possible from the etalon in order to minimize the field angle otherwise the sweet spot becomes too small. However the advantage of this solution is that the field of view is wider than with an external telecentric and the sweet spot is large enough for visual observing as well as for imaging. Moreover the amplification at the eyepiece can be varied, this is useful because a strong amplification is not always necessary (e.g. 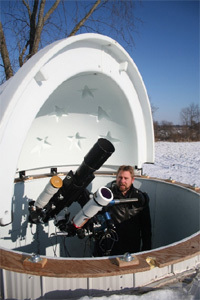 for prominences) and one can enjoy a wider field of view. The original telecentric of the Quark can easily be put back in place at any time, in fact I use my Quark with or without it based on what I like to do at the moment, for imaging I usually keep the telecentric in place. Last edited by krakatoa1883 on Tue Dec 11, 2018 12:58 pm, edited 1 time in total. Thanks for the pics and description on dismantling the Quark telecentric. I'm not sure you can unscrew the telecentric on the later batch quarks? Thanks for the heads upon this point Derek! I had a potential source of a lightly used Quark Chromosphere and a 'clearance' new Prom model in the past month and was thinking of trying one of them as the second etalon in a DS system behind the DSII module on the modded CR150. The setup that had me mount the primary LS80T etalon and the DSII module o the scope as DS worked well enough, but I have re-assembled the LS80T in SS mode. I really like that scope for FD and days when seeing doesn't support the larger apertures/focal lengths so I might wait to see what comes up used in the Quark Combo/Questar models but no rush. Raf and Mark, thanks for the info on these units. the telecentric is mounted in an inner black barrel that can't be removed from the device body without making the Quark unusable, however each lens group can be removed separately leaving the body as it is. The BF shall of course put back in place. Maybe a stupid question but is the modified quark better then the original? I wouldn't say better...just trying to use a different amplification optic to get around the built in 4.2x telecentric barlow. As far as contrast and definition are concerned, yes, with an external amplifier my Quark works better than in the original configuration, not a huge difference but is there, in particular if an external or internal ERF is placed in front of the device. Actually this is the reason that lead me to remove the telecentric. Of course the sweet spot shrinks but I found this tolerable, chromosphere details are preserved in most of the FOV depending on the Barlow's f.l. and distance from the etalon. This for my own Quark, I can't say nothing about other units and I am not recommending anyone to open the device because this makes the warranty void.